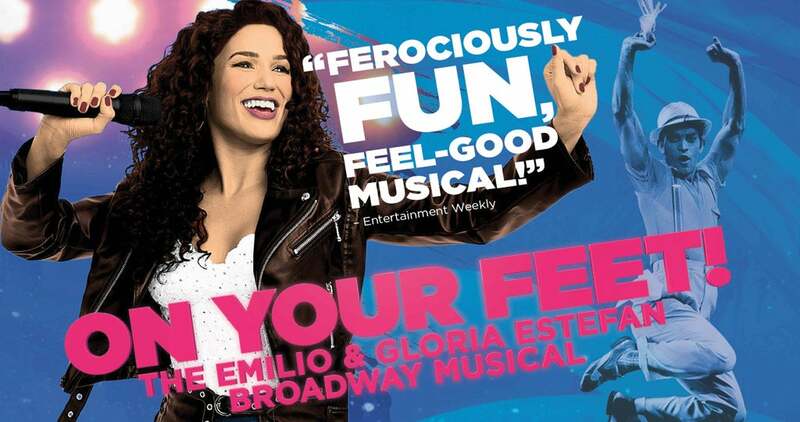 Tracing their steps back to the beginning, ON YOUR FEET!, tells the real life story of an innovative couple, Gloria and Emilio Estefan, who overcame trials and tribulations that fueled their passion and ultimately landed them on their feet. The show incorporates a spectacularly talented tour cast that is bringing the show to life nationwide! Cuban-American Broadway actress Christie Prades has the honor of portraying “the Queen of Latin Pop,” Gloria Estefan. Award-winning actor and recording artist, Mauricio Martinez, is making his Broadway debut as Emilio Estefan. Joining the Estefan’s are a cast of mostly Latino singers and dancers. But let’s not forget multiple Grammy Award-winning musicians from Miami Sound Machine will also be joining the National Tour. And what better place to tell their story than on the stage. ON YOUR FEET! checks off all the plot points: humble beginnings, showbiz obstacles, misfortune, success, plus a conga dance right through the theatre aisle. The set design includes highly creative glimpses of Cuba, Miami and the Estefan world. The show builds around the flowering of the Cuban-fusion sound. As the show spans through the decades, audiences watch Gloria’s look evolve in a series of fantastic costumes. Recreating Gloria’s wardrobe design was inspired by her extensive archives of personal family photos and tour fashion. ON YOUR FEET! captures everything from the look and vibrant sunsets of Miami through different eras to that life-altering bus crash. ON YOUR FEET! is filled with some of the most iconic songs of the past quarter century. Smash hits such as “Rhythm Is Gonna Get You,” “Conga,” “1-2-3,” “Get on Your Feet,” “Don’t Want to Lose You Now,” and “Coming out of the Dark”. The music of the show is catered to the hits of Estefan’s career. Most of the songs were written by Gloria or by both her and Emilio. It is jam-packed with different rhythms of dance, pop, Cuban roots and are all deeply rooted in Latin culture. The infectious energy of these upbeat tunes illustrates the soundtrack of the Estefan’s lives. This new Broadway musical is an inspiring story unlike anything you have ever seen on stage before. You don’t want to miss this epic cultural phenomenon that forever changed the history of Latin music. Fearless in their pursuit of success, ON YOUR FEET! is an explosive hit that will have you moving and grooving all night long!